Finally I have decided to create a business card to advertise myself as a freelance Sound Technician. When I do the sound gigs around town I figured that I should have a business that I could give out to anyone asking about my services. I do not work for a company, I work for bands who already have their own sound gear. I come and do the live sound mix for the shows using the band gear. 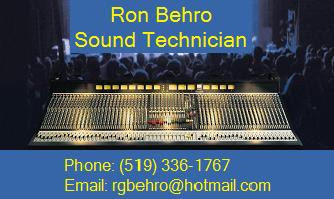 I would like to start my own sound company and work part-time as a professional sound tech in the Sarnia-Lambton area. My dream is to get some money together to buy enough gear for a medium sized sound system for most of the bands that play around here. I could just work out of my basement to start as to keep the costs down. If I have a business using just my own personal name then I would not be required to register a business name. If I were to create a company and give it a name, then I would have to register the name with the government. Standard business procedure. Now I just need to find the cash to buy some basic sound system gear. Mixing console, mics, stands, cables, power amps, speakers, subs, stage monitors, EQs, EFX processors, etc. Most people I have talked to about being a freelance tech all want to know if I have my own gear and that is where the problem is. Except for bands that have their own gear and just want a tech. With a sound system I would be in better shape to secure gigs with the many great bands and artists we have here in Sarnia. I will take any suggestions or help with creating my own sound company. I need some constructive ideas of how to begin. Any help will be greatly appreciated.